i have always liked figuring things out. a production run is like a puzzle of sorts. one must figure out and streamline the entire process. thinking about such things as efficiency, energy, materials. the order of things. and most importantly, the FLOW. the flow can refer to many things- the physical space in which i work-allowing me to move through my workspace without hinderance. the flow of energy as i choose and mix the colors, prepare the silk, thinking several steps ahead of myself so as to maintain that flow. the flow of work in and out of here as orders come and go, the flow of communication with all of those who email,comment,ask,etc..the flow of paperwork, money, and of course time. but most of all i enjoy the process of transition. of taking something rather plain and mundane (although i can say that the miracle of the silkworm is anything but mundane!) and turning it into something else by hand. 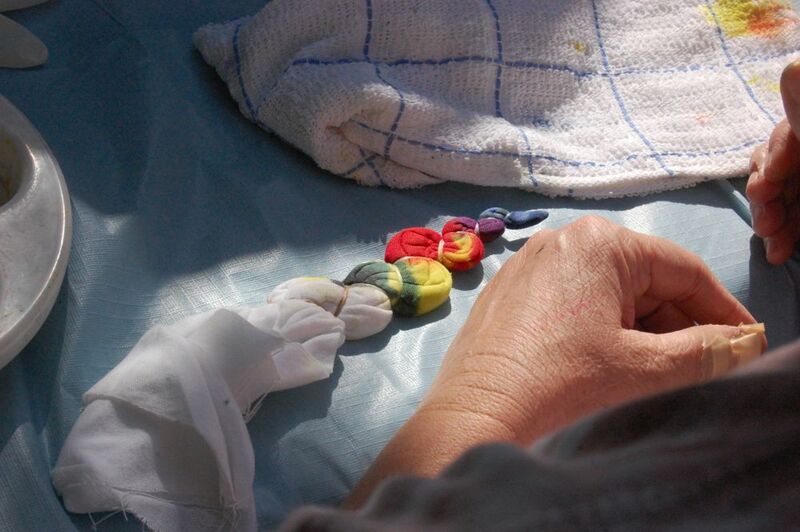 so, lots of shibori ribbon being made here at the moment. if i have overlooked an email, been tardy in sending you something promised-please send me a little reminder nudge and accept a proforma mea culpa from me. i appreciate your patience. in all this busyness, i have quite forgotten to post here about the upcoming workshop with Richard! speaking of flow. one also needs to refill the vessel and when Richard and I get together for a workshop that is part of the intention- to give you lots to wonder about- to get your flow going-or back into the flow. good grief…in my mind i had done it! but alas no- just on Facebook and constant contact. there are still a couple of spaces. and several requests to Skype/broadcast the workshop which we will be accommodating as well (figuring this out now). 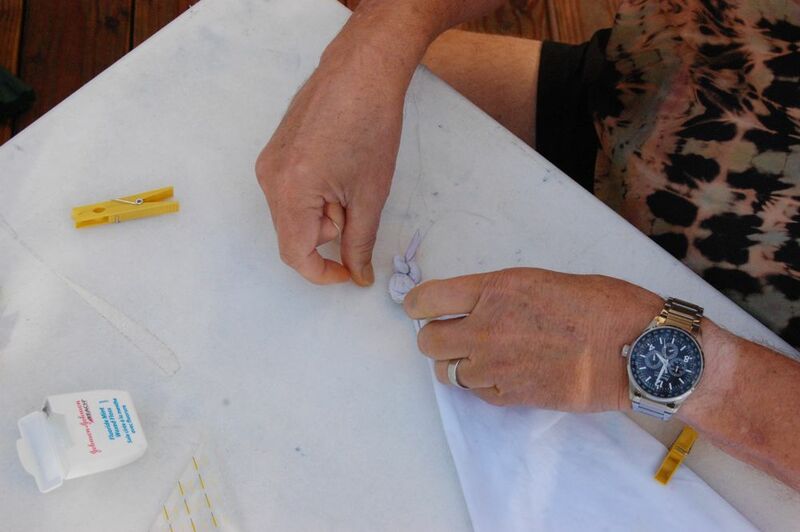 this workshop will combine itajime AND mandalas. you will learn both in the first two days. on the third day you can work on whichever one (or both) is moving you-and get into your own flow. of course we will be working on the process, the technique, of folding and dyeing and resisting-but also larger concepts of time and space in regards to patterns. patterns are everywhere-in nature and in life. sometimes you need to look at the bigger picture to see them. -some of Richard’s recent work-it just keeps on getting better and better (of course). 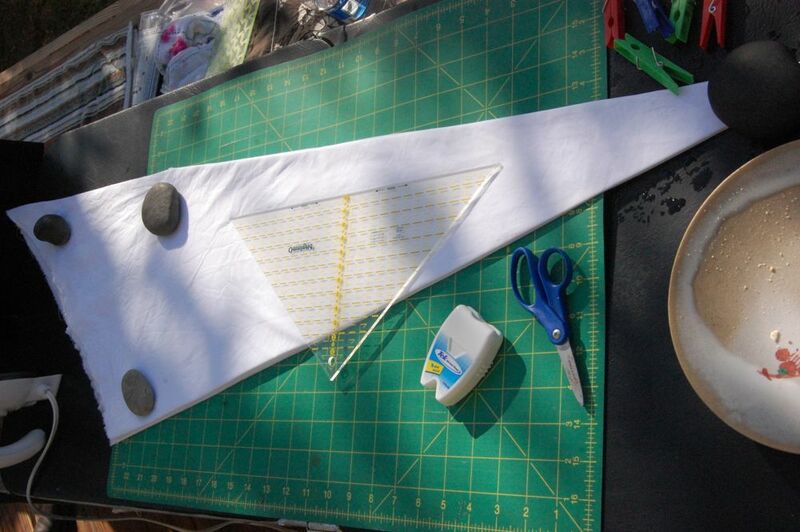 he recently completed his first continuous 10 meter cloth which is slated to be make into a summer yukata. now THAT’s impressive! This entry was posted in artists teaching art, boro, business of craft, contemporary shibori, dyeing, experimenting, indigo, inspiration, itajime, long beach art, mandala, shibori, shibori ribbon, silk, teaching, wondering, workshop and tagged itajime, JANM, mandala, richard carbin, shibori, shibori ribbon, workshop on January 24, 2014 by shiborigirl. I am tying up some loose ends on things that have been in the works around here for a while. Everything takes longer than expected it seems-especially around the holidays when there are lots of comings and goings. Today the wind died down a bit (not completely) but the surfers were devoted to getting into the water which leaves me in complete and blissful silence to work on these unfinished details. First- the In Studio Workshop with Richard Carbin and myself is available in the shop. Just click here to visit the listing and read through it carefully. If you have any questions, just use the contact form or email me. Leaving a comment here is OK too- I can reply privately via your comment. I’m excited to collaborate with Richard again. Ours has been an wonderful pairing of interests and talents. We met virtually via Flickr several years ago becoming fans of each others work. Richard is an ex-pat living in Nagoya Japan with his wife and two boys. In June 2009 when Phil & I visited Nagoya for the Arimatsu Shibori Festival, we made a pact to meet up and get to know each other better and in person. We visited late into the night and although our work is completely different we shared a passion for Japan, silk, and dyeing. Afterwards, we continued getting to know each other online via Facebook and via email and decided to create a collaborative workshop. Our online workshop Indigo Mandalas (born of the original In Studio workshop last year) was the first internationally collaborative online workshop as far as I know. We continue to inspire and draw on each others experience and interests using the internet & media, learning as we grow. Secondly, the Silk Study Tour to Japan is filling nicely. We only have 4 spots (out of 20) left so, if you think a trip to Japan to see silk sericulture, beautiful textiles, a natural dye workshop and more are in your future for May of 2013-contact me soon. We never really know if we will repeat this tour-so far our third biennial tour. Life has a way of keeping us on our toes and in the present which is a good thing and keeps up from putting off those things that we really want to do but somehow don’t. More and more I realize that today is the day! Click the link for details and feel free to contact me if you you have any questions at all. I’m getting excited all over again. New things await us in Japan every time we go! 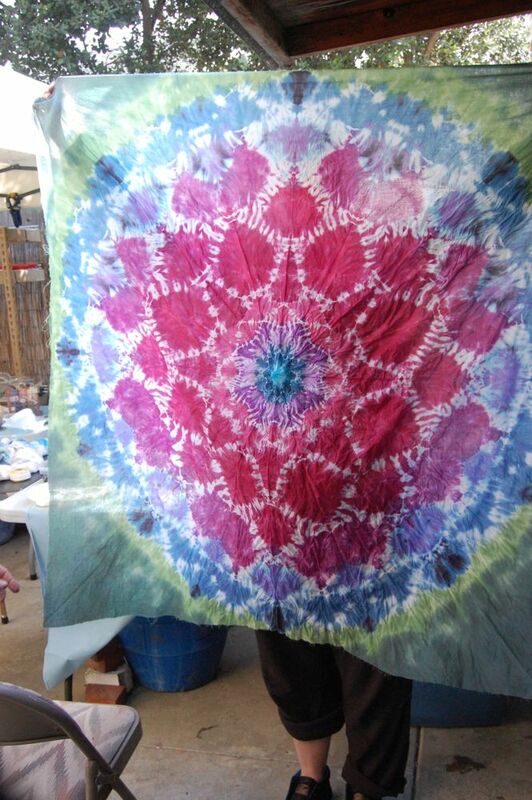 This entry was posted in arashi shibori, mandala, sericulture, shibori, silk, silk study tour, silkworms, workshop and tagged arashi shibori, japan, mandala, richard carbin, shibori girl, silk, textile tour, workshop on December 28, 2012 by shiborigirl. Next- there will be a new in-studio workshop announcement next week. Dates look like they will be end of January/ early February. It will be a combination workshop featuring Richard Carbin’s mandalas and my arashi shibori techniques. Day one will be mandalas with Richard and myself (assisting) and day two will be with me learning arashi shibori techniques and Richard assisting . 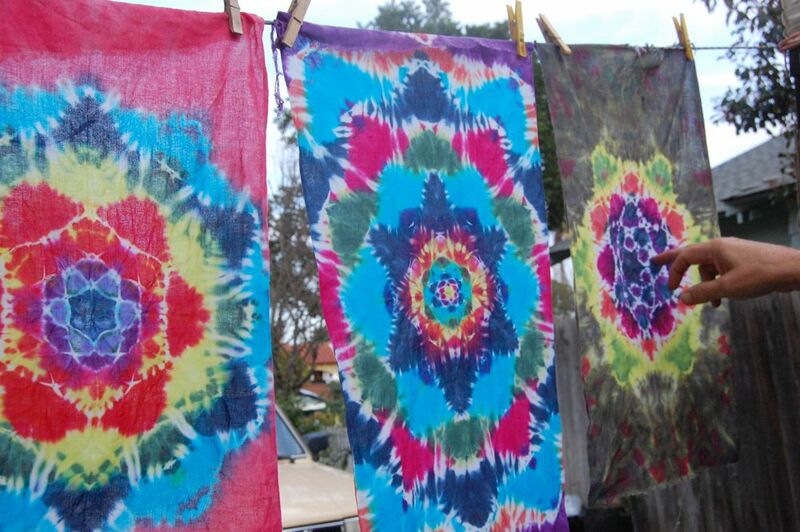 Day three will be a free dye/play day to practice some of the skills you have learned. We are still working out the details but you can sign up for day one, day two, day one & two (a little discount), and day three will be reserved for only those who have taken day one or two or both (both days will get you a nice discount on day three). 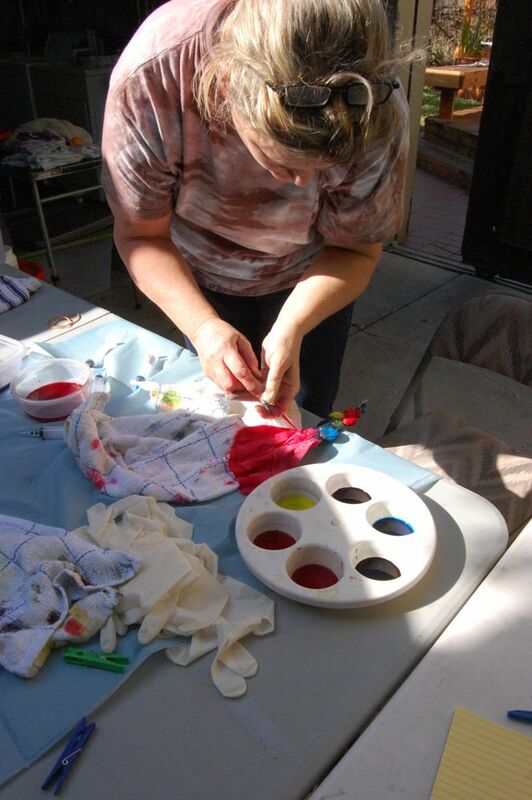 We will work with procion (Richard’s fave), colorhue, and acid dyes and even the indigo vat. It will be limited to 6 people each day. I’m just getting things set up so I can list it in the shop sensibly. So much going on right now. Does it ever slow down? I wonder…what if we combined arashi and mandalas…. 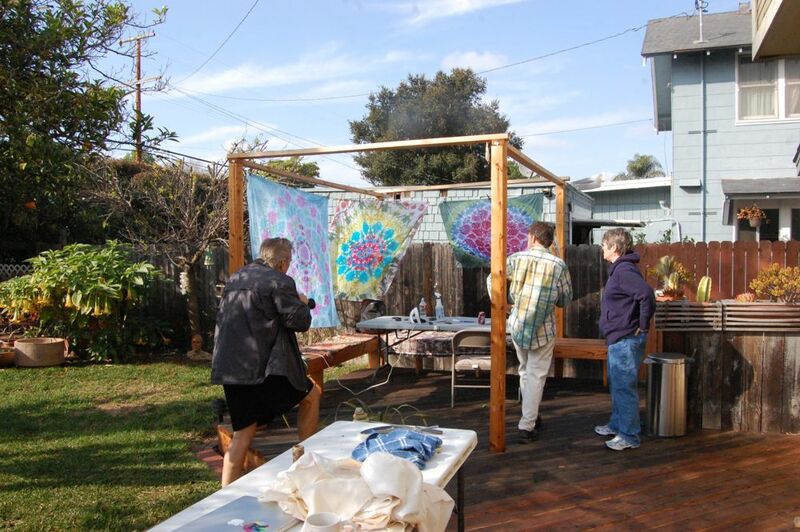 This entry was posted in arashi shibori, experimenting, mandala, shibori, wondering and tagged dyeing, indigo, mandalas, richard carbin, shibori, workshop on December 14, 2012 by shiborigirl. The vats took a nap for a couple of days while cold air whipped through southern California. I woke them up yesterday afternoon, the sun having warmed them a bit. 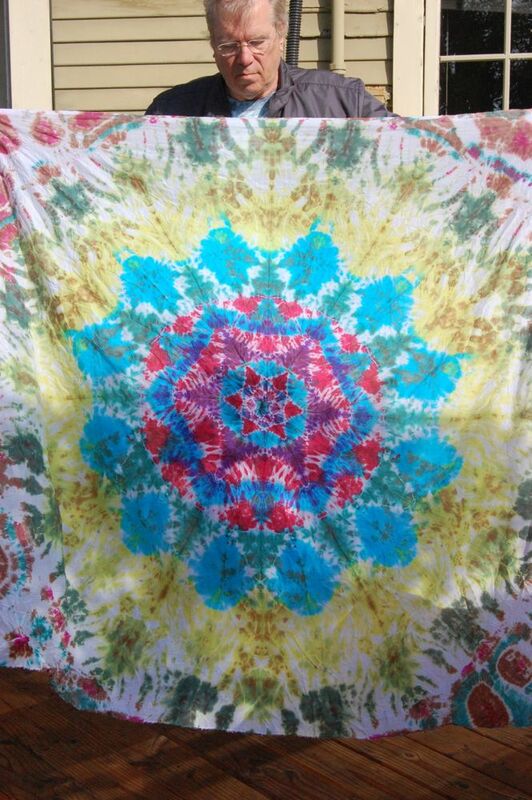 I tied this piece on cotton a few days back, wondering how I would dye it. The other end is ombré dyed and I think I will mount it for a wall piece. This is Richards technique put to another use. 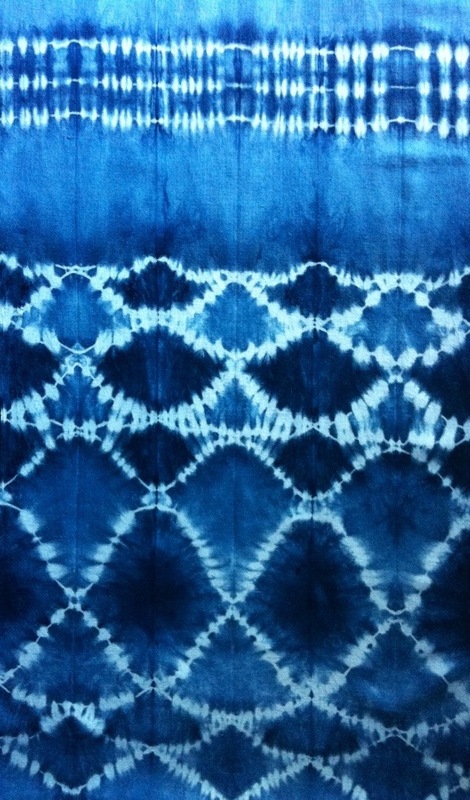 This entry was posted in indigo, online workshop, shibori and tagged indigo, richard carbin, shibori on March 20, 2012 by shiborigirl. well, we are down to the last night. we have had a blast and shared a lot of things. our hands are blue and a few other colors to boot and most of what we made together is on its way to some of you to be stitched and wondered about. 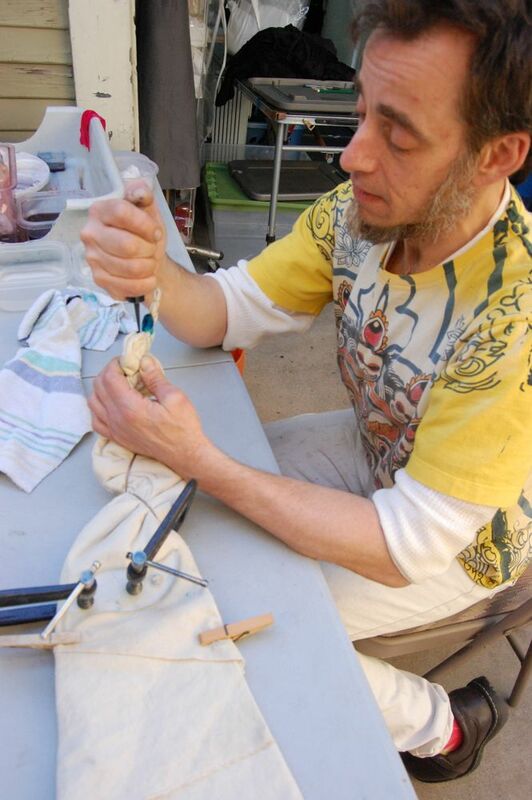 we thank those of you who came to the workshop, those of you who stopped in to meet Richard and sample his dye work. we also thank those of you who cheered us on here at the blog as well as from our facebook pages. it was an experiment, a longshot, an idea we had a year ago and now here we are at the end and thinking of some new beginnings. it’s been great working with another dyer this way- gonna have to do this again! we have added the last of the fabric mandala sets to the big cartel shop and are covering up the indigo vats for now. 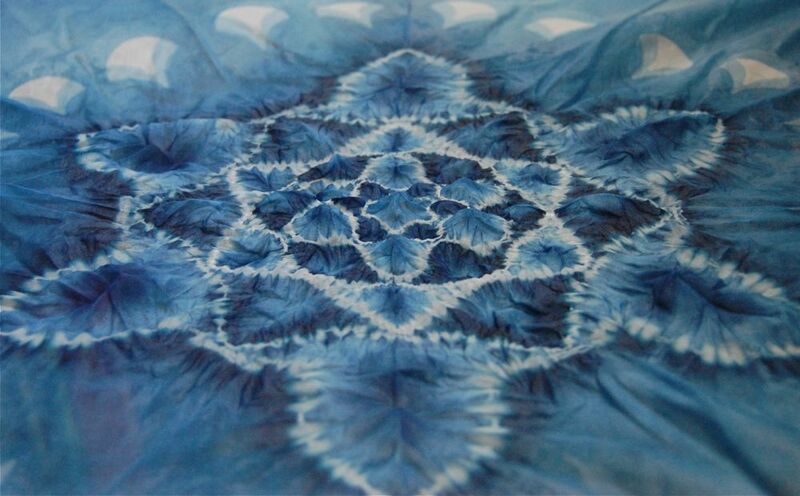 This entry was posted in indigo, shibori, silk and tagged dyeing, indigo mandala, richard carbin, shibori on February 23, 2012 by shiborigirl. Richard Carbin (aka AsiaDyer) is still here and we are still busy but I wanted to get a few photos up from the workshop before we get going here today. Also we have put a few things into the bigcartel shop just to get the day started. we welcomed folks to the workshop with a little display out front- just to let them know they were in the right place and to entertain any passerbys. 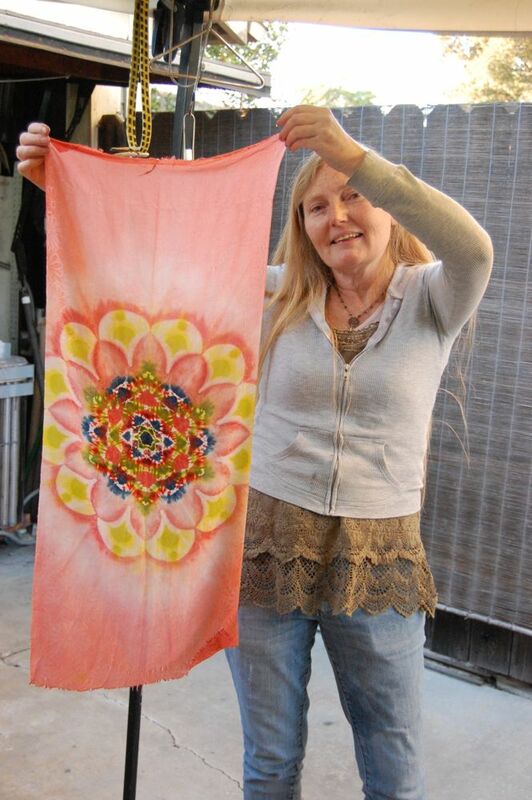 under richard’s tutelage, i did a practice piece on silk kimono lining with colorhue dye. learned a lot! and here is the next thing we did with indigo…he was hooked! we ended the workshop by collecting up, ironing and looking over all that had been done. 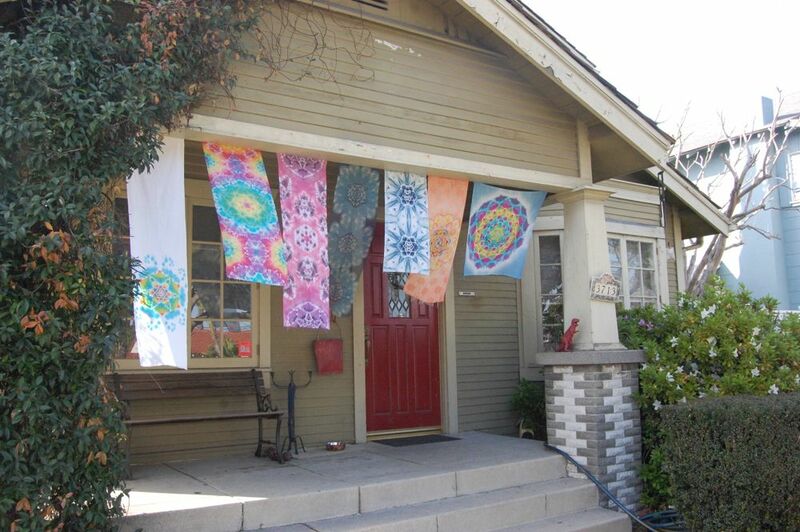 we worked large and small scale, with cotton and silk, with mx, colorhue, and indigo and sent more mandala energy out into the world! interestingly, this video on Carl Jung’s patient’s artwork appeared that same day. (link removed 2016 as it is no longer working) However, you can google the words Carl jung and mandala and see the connections. Here is one. I will finish up here with a teaser of indigo we have just loaded into the big cartel shop. Richard is already deep into the indigo vat this morning and i am dyeing to join him!! 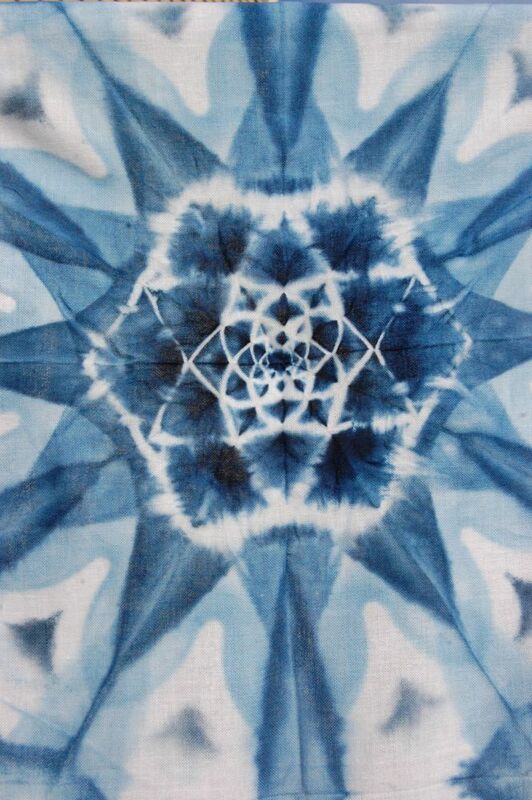 This entry was posted in dyeing, indigo, shibori, textile therapy, wondering, workshop and tagged AsiaDyer, indigo, indigo mandala, mandala, Mandala tie dye, richard carbin, shibori on February 22, 2012 by shiborigirl. Is it seriously the end of January? I have been remiss…but busy at other things. 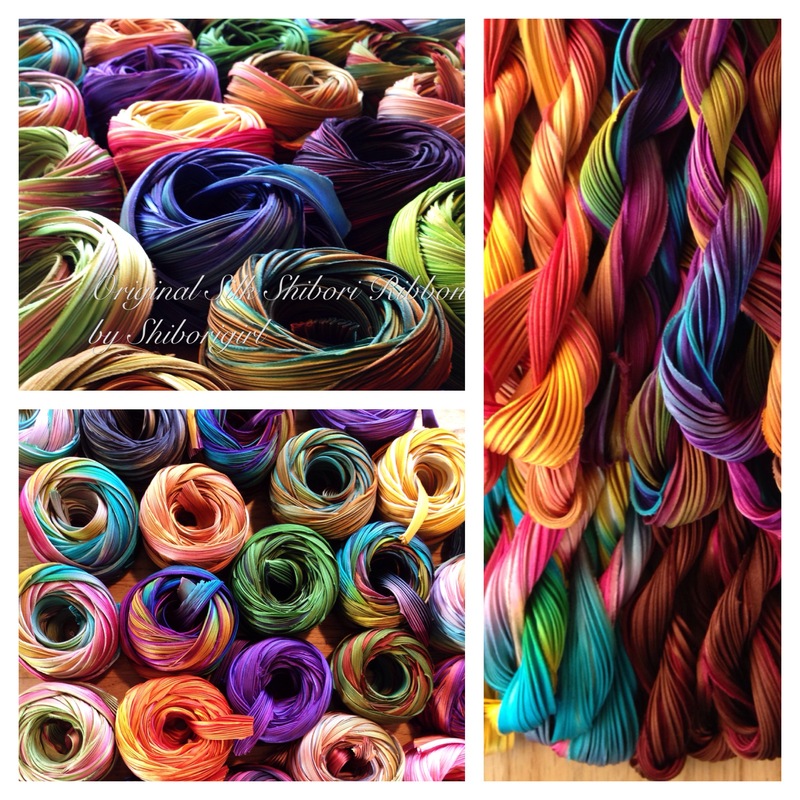 Shibori things, indigo things, workshop things, organizing things, sales tax things (ick! ), among other things. 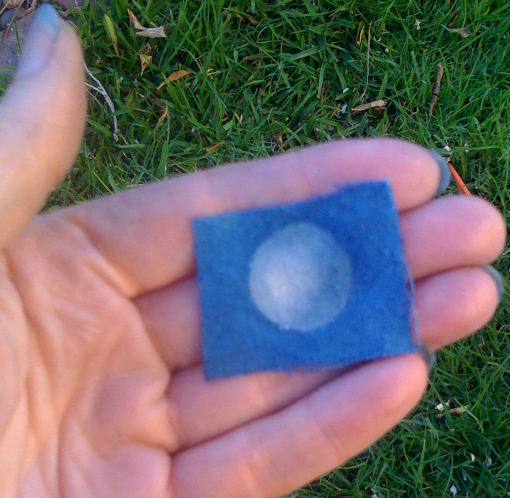 Those of you signing up for the online indigo workshop that starts in march- many thanks. You will receive an email mid February discussing what materials to begin gathering. 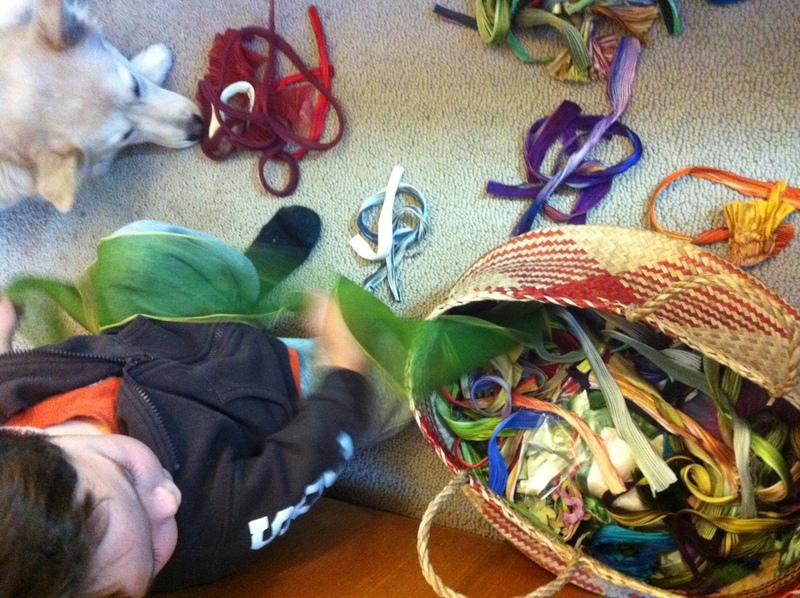 We are also having some company this week…some busy hands who were helping me sort ribbons into color piles this morning as I stitched some shibori ribbon flowers for an order. A simple beauty as he discovered each color and opened and closed the pleats. Later on, we did some painting. He keeps his mom very busy and anyone else in close proximity! The 2 day indigo workshop at the JANM was a real treat- a great group as usual. Some very beautiful fabrics were created. Photos and more on that later in a separate post but there is one more workshop coming up at the JANM March 3-follow the link to sign up. 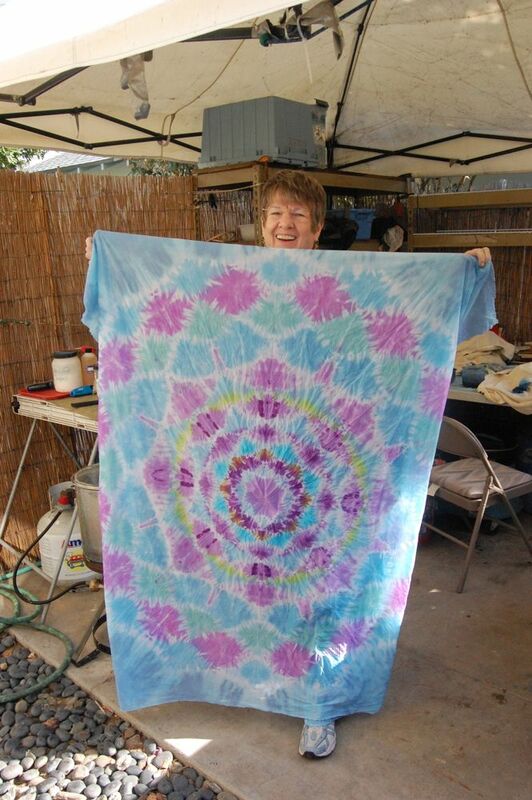 But the really exciting news is that my friend from Nagoya-Richard Carbin, mandala dyer extraordinaire is coming to teach mandala dyeing at my studio in Long Beach Feb. 18-19. This will be a real treat. The workshop is limited to 4 people as it will be hard to manage more right now. You can read more about the workshop and sign up here. Richard and I became fans of each others work via Flickr several years ago and more recently on Facebook. Richard is an ex-pat living in Nagoya Japan with his wife and two boys. Last May when I visited Japan for the Silk Study and the Arimatsu Shibori Festival, we made a pact to meet up and get to know each other better and in person. 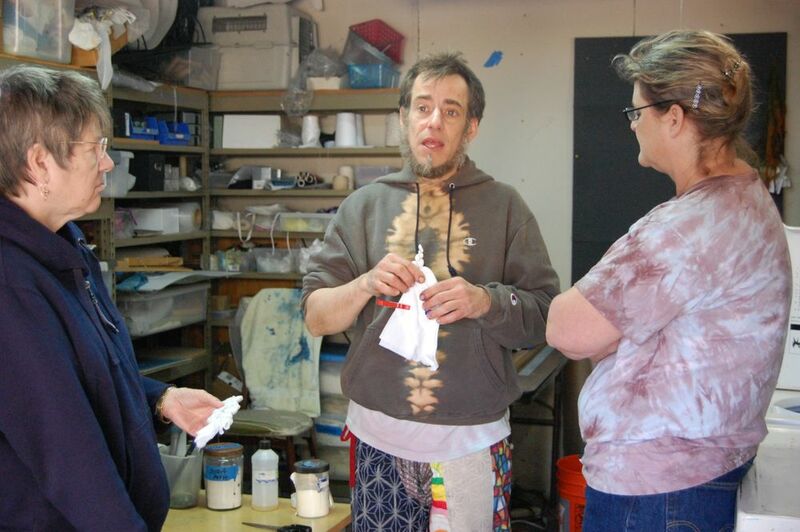 We visited late into the night (you know how dyers can be…) . 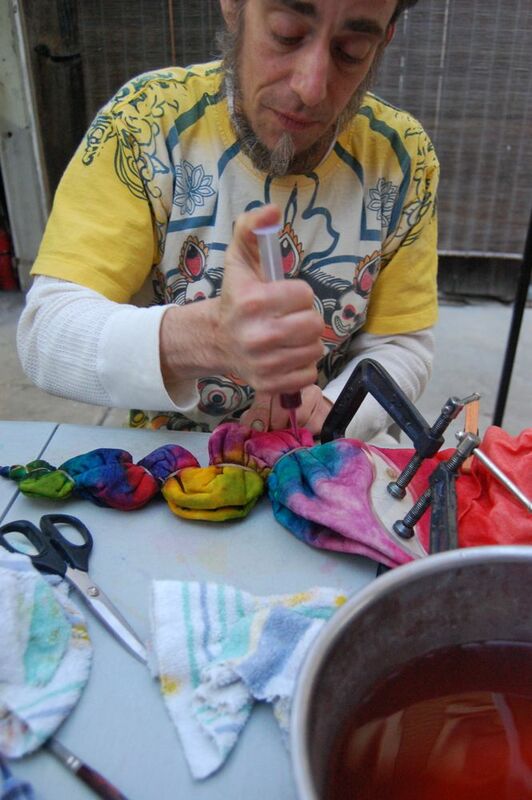 He has a unique talent with techniques he has developed over many years and will be teaching his mandala dye technique here in my Long Beach workspace next month. I will assist and add indigo to the mix along with some other surprises. Way back then I was taken by the beauty and skill of his dye work. I have been doing some thinking lately on beauty and I believe it is at the core of what we tend to think of as art. No matter what name we give it, we humans seem to have a need for it-whether we observe the beauty around us or whether we create it. Beauty calms us, it can capture timeless moments and asks us to slow down and observe. Beauty speaks to a higher order, is captivating, and allows us to see into the heart of things. 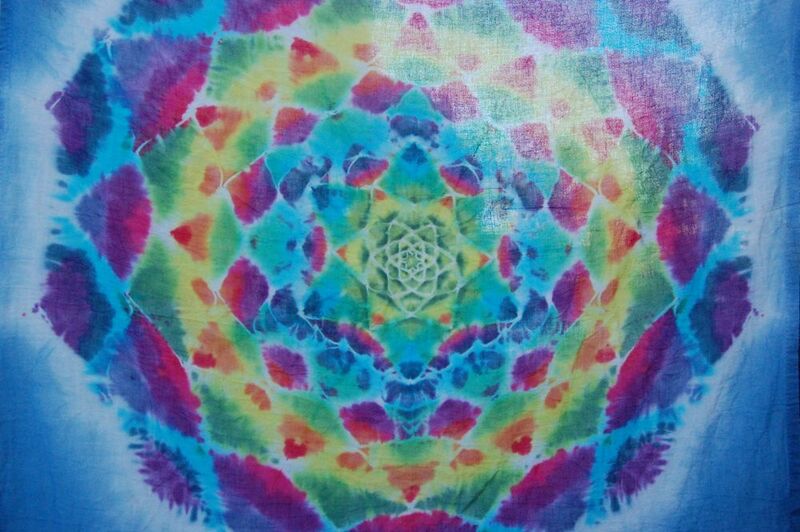 Richard’s mandalas are like that to me- like I am looking into the core of beauty. 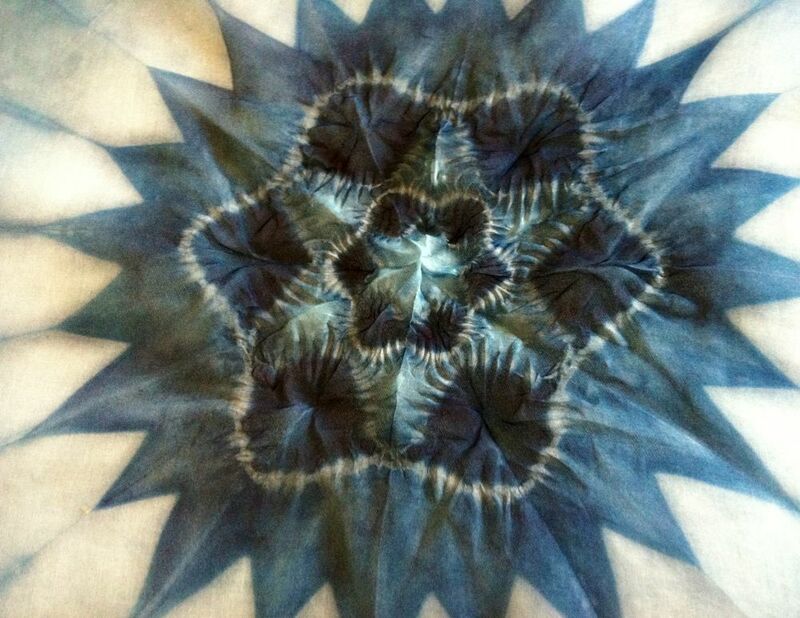 This entry was posted in dyeing, experimenting, inspiration, itajime, online workshop, shibori, workshop and tagged indigo, JANM, mandala, mandala work, ribbon flowers, richard carbin, shibori on January 26, 2012 by shiborigirl.